How to select one gene at a CpG site? Question: How to select one gene at a CpG site? Hello, I have some problem to process TCGA public data. 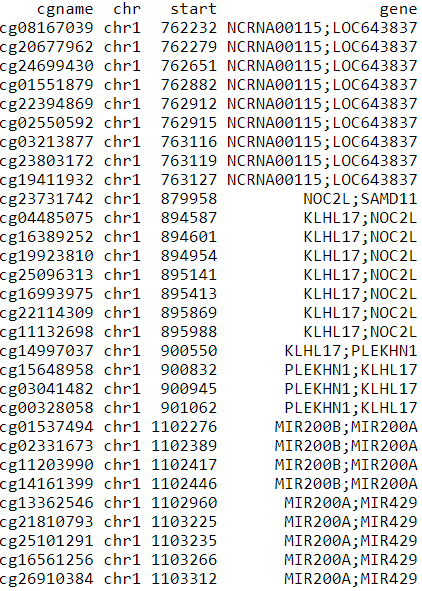 I downloaded TCGA breast cancer's methylation data with annotation information using "TCGAbiolinks" package of R but there are some CpG sites which have multiple gene symbols at each. However, I need data which have 1 gene symbol at 1 CpG site for analysis. Is there any criteria or method? Please provide an example site and the genes you see. I added figure. It is a part of my annotation data. I think bi-directional promoters exist for a non-trivial number of genes. While I don't think the overall percentage (or the gene-overlapping percentage) is as high as you may expect from your screenshot, one possible solution would be to use the gene regions like TSS200 or TSS1500 and only consider them if they only have one gene annotation (and/or keep the paired name, and visualize methylation and/or expression for the region including both genes). How to avoid annotating multiple genes to a single CpG locus? how to calculate distance between CpG site and TSS? How to map CpG ids to nearest genes? Can splice-site mutations be treated as gene knock-outs? Gene symbol for original TCGA data ...help! What does 'distance to cpg' mean? And what is it used for? Gene symbol disambiguties when match different gene symbol lists. Can DNA Methylation data of different samples from Human Methylation 27 and 450 platforms be combined using common set of 25,978 CpG sites?